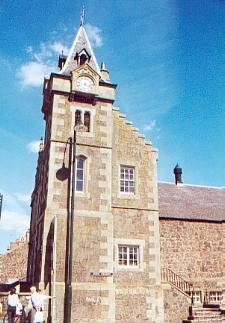 A market town and commercial centre in South Lanarkshire, Biggar has been a burgh since 1451 and lies 14 miles (22 km) southeast of Lanark at the site of the Battle of Biggar (1297) at which William Wallace and Sir Walter Newbigging defeated Edward of England. Biggar developed in association with cattle markets and textile and brewing industries. The town was once served by the Symington, Biggar and Broughton Railway, which opened in 1860 but closed in 1966. Today its industries include engineering and the distribution of fine foods. Facilities include Biggar Sports Centre, co-located with Biggar High School which moved to new premises in 2009, a primary school and a post office. Biggar Kirk (the Church of St. Mary) dates from 1546 and was one of the last pre-Reformation churches to be built in Scotland. It stands on the site of the earlier church of St. Nicholas. In its graveyard are buried the ancestors of the politician William Gladstone (1809-98). St. Isidore-the-Farmer Roman Catholic Church dates from 1937.
Notable attractions include the Biggar & Upper Clydesdale Museum, the Gasworks Museum, the Albion Motor Museum, the Greenhill Covenanters' House (17th-century) and the Victorian Puppet Theatre which still offers performances. The town hosts an annual arts festival in October, the Biggar Little Festival. John Brown, author of Rab and his Friends, was born in Biggar in 1810, while the designer of the Scott Monument in Edinburgh, George Meikle Kemp, was born near the town in 1795 and another writer, Hugh MacDiarmid (1892 - 1978), lived nearby at Brownsbank Cottage.